Gain certification to a maximum depth of 18 metres! Now is the time to dive into the PADI Open Water Diver course, the most popular dive programme in the world! This is your ticket to a lifetime of intense adventure with PADI, the dive certification that sets the standards in the global diving community. Virtually anyone who is in good health, reasonably fit, and comfortable in the water can earn a PADI Open Water Diver certification. You must be older than the age of 10 to begin the PADI Open Water Diver programme. The PADI Junior Open Water Diver programme is available for youths 10 and 14. A PADI Junior Open Water Diver between the ages of 10 and 11 years may only dive with a PADI Professional, a certified parent or certified guardian to a maximum depth of 12 metres/40 feet. 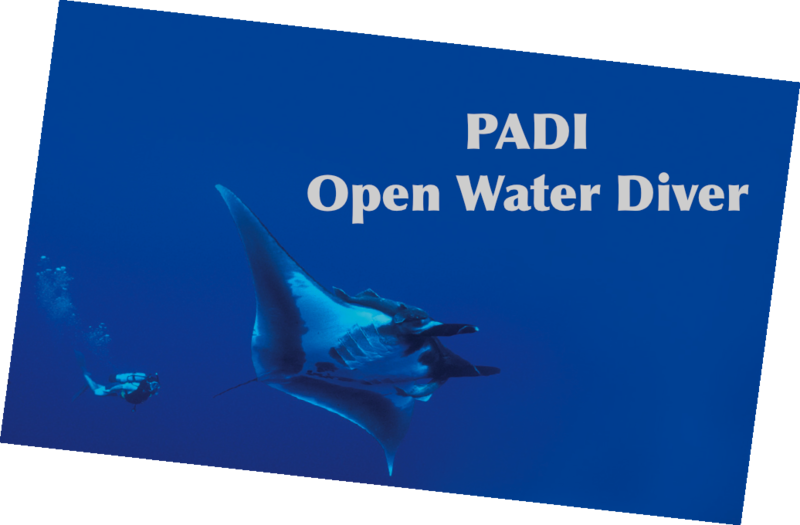 The PADI Open Water course is made up of 5 confined water dives (pool dives), theory knowledge development and 4 open water dives. PADI programmes are performance based and you proceed as you demonstrate mastery of the course skills. This allows you to work at a pace that is comfortable for you. ​At Dive Rutland we provide you fundamentals of scuba diving, including dive equipment and techniques. In fact we provide you with all the equipment you need to complete the course (you need to provide your own swimming attire) and ample opportunity to learn, practice and have fun! Usually courses take about four/five pool sessions and two Sunday mornings. All our Open Water dives are conducted in Dry Suits (please note not many dive schools do this) and as such you also need to attend a dry suit orientation in the pool prior to going to open water. All PADI Open Water Courses are the same! This is a statement we hear a lot, but we disagree not everything is the same or equal. Have a look at our How to Choose a Dive Centre article. ​Dive Rutland is committed to helping you learn to dive at a pace that suits you. All of our open water diver courses start flexibly, you can start when you wish. Our schedule is built individually around you and your work/family commitments. You don't have to wait to start a course with us. Our Open Water training days are scheduled months in advance giving us the ability to plan your course to achieve by dates that suit you. Are there any other costs other than the course fee? You’ll need to cover two entry fees to Stoney Cove or other site as part of the standard course – payable on the day to the site. These are usually around £22.00 per day. You will also need to cover your personal travel costs. the most widely recognised and respected diving qualification in the world giving you the freedom to dive with a buddy independent of a professional. Dive Rutland is a PADI 5 Star Instructor Development Centre, a recognised and authorised diver education establishment. This rating places us in the highest quality assurance process within the Diving Industry. All training is overseen by a PADI Course Director, the worlds highest instructor certification, and we have a range of experienced male and female PADI professionals on our staff. All equipment is modern and regularly serviced. We have a large range of school equipment to fit all sizes and shapes. Our breathing air quality is monitored and externally verified regularly. We are fully insured and meet all legal obligations placed upon us. This includes full risk management and our staffing ratios exceed industry standard requirements at 1:1 or 1:2 for Open Water diving. We are a 100% AWARE Partner, so your certification includes a donation from us to support Project Aware, which results in you receiving a certification card that shows you support Project AWARE. Don't Want to spend your holiday learning to dive but do want to enjoy the scenery below the water or just do not fancy completing your open water dives here in the UK, then PADI Open Water Referral is for you. You complete the confined water sessions and theory here in the UK and the four open water dives somewhere sunny, by taking an Open Water Referral away with you. Here at DIVE Rutland we recognise that not all divers wish to learn in UK waters. However, you may find that exchange rates may mean you pay more for your course overseas than you would if you complete with us. ​You can enroll on to our Referral Course and Upgrade to complete your Open Water dives here, with us, for the same price as our Open Water Diver full course! Easy. Once you've got your Open Water Diver certification DIVE Rutland can help you progress to Advanced Open Water Diver rating - CLICK HERE for more information... be prepared!